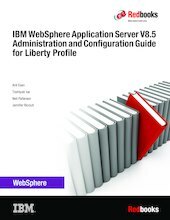 IBM® WebSphere® Application Server V8.5 includes a Liberty profile, which is a highly composable, dynamic application server profile. It is designed for two specific use cases: Developers with a smaller production runtime, and production environments. For developers, it focuses on the tasks that a developer does most frequently, and makes it possible for the developer to complete those tasks as quickly and as simply as possible. For production environments, it provides a dynamic, small footprint runtime to be able to maximize system resources. This IBM Redbooks® publication targets administrators of Liberty environments. It provides the information needed to create, configure, and manage Liberty servers. It includes information about managing multiple servers in an installation, including the use of the new administrative capabilities introduced in WebSphere Application Server V8.5.5.7.